These Thanksgiving coloring pages can be printed off in minutes, making them a quick activity that the kids can have fun with in the weeks before Thanksgiving or even the minutes before dinner is served. There are hundreds of fun Thanksgiving pictures to color here with images of turkeys, pilgrims, cornucopias, Native Americans, Thanksgiving dinner, cooking, pumpkins, and more. And once they're colored, you'll have Thanksgiving decorations for your home. These Thanksgiving coloring pages can also be an excellent way to introduce the kids to the history of Thanksgiving in a fun way that will catch their attention. If this isn't enough, you can find more Thanksgiving coloring pages for this time of year including free turkey coloring pages and fall coloring pages. There are a few Thanksgiving coloring pages here that your child will have a blast coloring. You'll find Thanksgiving coloring pages of turkeys, pumpkins, ships, cornucopias, and Thanksgiving dinner. There are several Thanksgiving pictures that can be printed as black and white so your child can color them or you can even print them in color. Your child can still decorate the color ones or just use them as is for some quick Thanksgiving decorations. There are also some free Thanksgiving tracer pages that double as a coloring page and writing practice for your child. There are a lot of unique Thanksgiving images here that are so cute you won't be able to keep a straight face. Print out some favorites and let your kids decide. Among all the free Thanksgiving coloring pages here you'll find pictures of cornucopias, pilgrims, Thanksgiving meal, ships, pies, and turkeys that your child can color. Click on the link and then print the Thanksgiving coloring page straight from your browser. 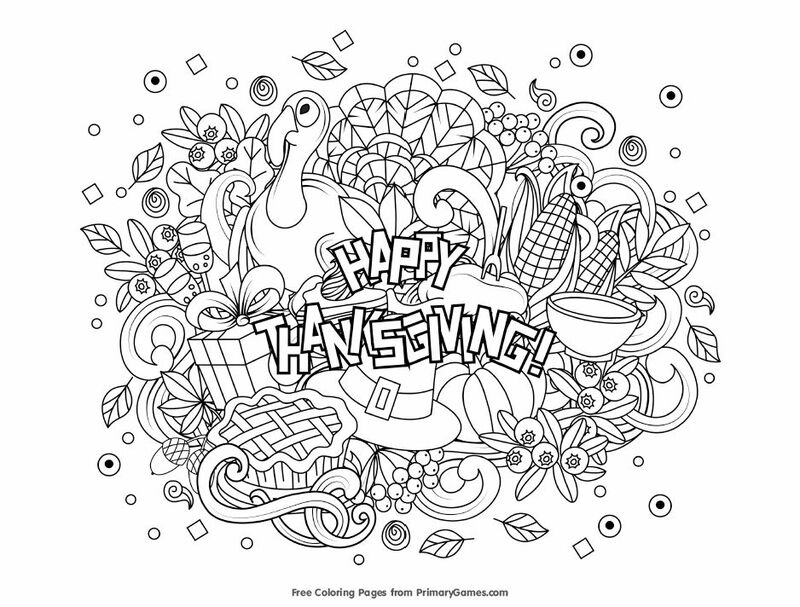 You'll find 10 pages of Thanksgiving coloring pages here including a ton of fun images. There are turkeys as well as all your other favorite Thanksgiving images. If you prefer silly images, this is the site for you. Scroll through the list of Thanksgiving coloring pages and click on the link of the coloring pages you like best. These coloring pages from Crayola include turkeys, food, pilgrims, cornucopias, and more. If you are looking for a Thanksgiving activity, there are even bingo cards the kids can color in and then play. Doodle Art Alley has a ton of unique Thanksgiving coloring pages with pumpkins, turkeys, cornucopias, pilgrims, and other fun Thanksgiving images. Simply click on a thumbnail to open up a free PDF file you can print directly from your browser. The site Apples4theTeacher has a nice collection of Thanksgiving coloring pages that spans across three pages. Be sure to use the links at the top of the page to view categories including pilgrims, turkey, harvest, or Native American coloring pages. The Thanksgiving coloring pages at Coloring.com can either be colored online or printed out and colored with crayons. Either way, your child is going to love coloring these fun pictures of Thanksgiving rituals and symbols.